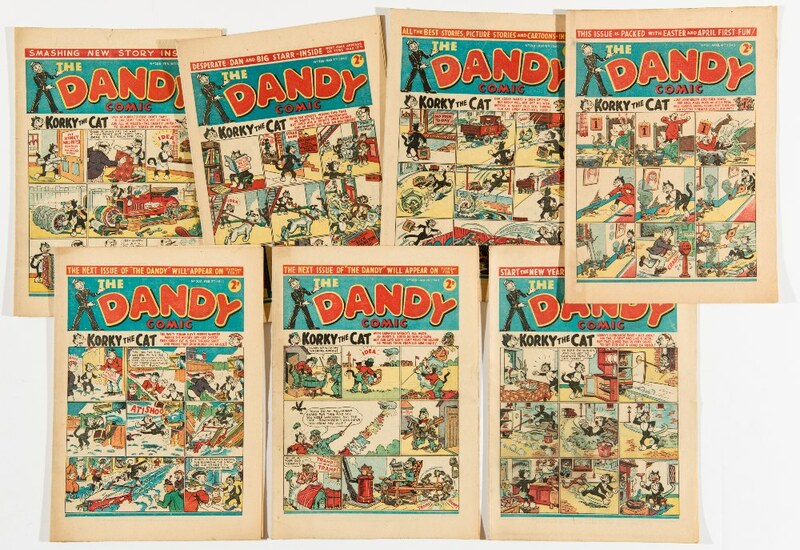 Dandy (1942) 205-211 Jan 10 - April 4. Propaganda war issues. First Peter Pye by Dudley Watkins. Unfortunately, your registration has been declined by the auctioneer. You can contact the auctioneer on 020 7424 0007 for more information. You are the current highest bidder! To be sure to win, come back on 08 Mar 2015 14:25 GMT Date Format as the lot closes or increase your max bid. We offer an in-house high quality world-wide shipping service. We will send you an email attachment with post and pack details added to your winning bid paperwork within four working days. All UK parcels are fully insured and sent via Royal Mail Special delivery (generally under 2 kgs) and through our couriers, DPD Local - both next day services. International parcels are generally sent via the Post Office and fully insured. We are happy to quote for any other post and packing requirements should you wish. 1. Comic Book Auctions Limited ("Compal") trades under these terms and conditions only, and no alteration or addition to these terms and conditions binds Compal unless accepted by Compal in writing. These Terms and Conditions supersede all previous editions. 2. Compal sells as agent for the Seller and is not responsible for any act or omission of the Seller or Buyer. 3. While every effort is made to ensure the accuracy of description of lots, Compal does not warrant the accuracy of descriptions. All statements of any nature (whether in writing or oral) made by Compal are statements of opinion only, and no responsibility is taken for the accuracy of any opinion given. 4. Compal reserves the right at its sole and absolute discretion to refuse any bid, divide or amalgamate any lot, or to withdraw any lot. 5. All transactions to which these terms and conditions apply shall be governed by English law and all parties submit to the exclusive jurisdiction of the English Courts. 6. The copyright in all words and lot illustrations remains the absolute property of Compal and any person wishing to use it shall obtain the prior written consent of Compal. 7. The Seller is the person placing lots with Compal for sale at Compal auctions. The Seller warrants to Compal and to the Buyer that he is the true owner of the lot or is authorised to sell the lot by the true owner and is able to transfer good and full title to the lot free from all charges liens claims and encumbrances of any nature. 8. The Seller indemnifies Compal and the Buyer against all claims and proceedings arising from a breach of condition 7 and shall reimburse Compal and the Buyer upon demand for any and all loss expense or damage arising therefrom. 9. Compal is entitled to deduct from the bid price placed by any Buyer commission of 20%, entry fees of £1 per lot and insurance of 2% of the Reserve. The balance is the "sale proceeds". 10. The Seller acknowledges Compal’s right to retain the premium payable by the Buyer in accordance with these conditions. 11. The Seller may place a Reserve price on any of his lots. All lots will be sold without Reserve unless a Reserve has been agreed by Compal. The level and existence of Reserves are confidential. 12. The Seller authorises Compal to accept bids of less than the Reserve, provided that any amounts due to the Seller are calculated as if the lot had been sold for the Reserve. 13. Compal shall pay to the Seller the sale proceeds not later than one month after the closing date of the relevant auction provided that the sale proceeds have by then been received by Compal. If the sale proceeds have not been so received, Compal shall pay the Seller the sale proceeds within 14 working days after receipt from the Buyer. 14. If the Buyer fails to pay the purchase price to Compal within 42 days of the closing date of the relevant auction, Compal may (at its sole option) notify the Seller and return his goods to him. 15. Compal has the right to photograph and illustrate any lot and to use such photograph or illustration as it deems fit. 16. If a lot is unsold, Compal shall notify the Seller and the Seller shall either arrange for its collection from Compal or instruct Compal to offer the lot for sale again. Failure to comply with this condition within 28 days shall entitle Compal to sell the lot for any price and deduct from the sale proceeds any sums owing to Compal by the Seller. 17. The Buyer is the person submitting the highest bid in the appropriate manner for any lot at the relevant auction (being the highest bid at the closing date in postal auctions or the highest bid before the hammer falls at live auctions, provided in either case that the bid is acceptable to Compal in its absolute discretion) and Compal shall settle any dispute finally at its absolute discretion. 18. After the closing date or the live auction (whichever is the later) Compal shall reduce the highest postal bid (but not the highest live bid) for any lot to 10% above the next highest bid. 19. The Buyer shall pay to Compal for each lot the bid price, a premium of 14% of the bid price, the postage and packing charge (the "subtotal") , and if he pays by credit card a handling charge of 2% of the subtotal (together "the purchase price") and the Buyer acknowledges that Compal may receive the commission due from the Seller in accordance with these terms and conditions. At live auctions payment may be made by debit or credit card on the day, but not by cash. The Buyer may take away on the day his lots paid for in this way. If the Buyer pays for any lots by cheque, Compal will ship the lots to him once the cheque has cleared. 20. Upon acceptance of a bid by Compal, a contract of sale is completed between the Buyer and Seller. Compal is not a party to the contract, and shall not be liable for any breach of it by the Buyer or the Seller. Ownership of any lot will only pass to the Buyer when he has paid the full purchase price for it. 21. The purchase price must be paid to Compal no later than 7 days after the date of the invoice which Compal sends to the Buyer. 22. The Buyer is responsible for any loss or damage to any lot he has purchased from the date of his invoice and neither Compal nor any of its employees or agents shall be responsible for loss or damage of any kind caused while the lot is in its custody or control after that date. 23. If a lot is not paid for in full in accordance with these conditions, Compal as agent for the Seller and without further notice to the Buyer shall at its absolute discretion be able to do any one or more of: a) re-sell the lot; b) remove, store and insure the lot at the expense of the Buyer; c) charge the Buyer interest on the purchase price at 3% above the base lending rate of National Westminster Bank plc from time to time; d) retain any lots sold to the Buyer at any Compal auction until payment of the purchase price; e) apply the proceeds of sale of any lot due at any time to the Buyer towards settlement of the purchase price; f) exercise a lien over any goods belonging to the Buyer which are in Compal’s possession or custody; g) rescind the sale of that and/or any other lot sold to the Buyer at any Compal auction; h) issue legal proceedings against the Buyer for damages for breach of contract. 24. Prior to bidding, Buyers must satisfy themselves as to the condition of lots in person at live auctions or by our Appointment to View service. Neither the Seller nor Compal (nor any employees or agents) are responsible for any errors of description, and no warranty is given. Your stautory rights are not affected.